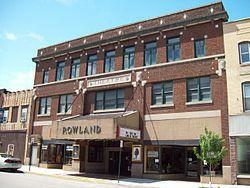 We are located at 125 North Front Street; Philipsburg Pa 16823 in the Historic Rowland Theater Building. We are proud that in addition to providing us a home this choice of location also supports this key community hub. We are currently accepting resumes for alternative Healthcare Providers and Fitness Instructors for independent contracting. We require proper state licensing and/or certification and professional liability insurance. If you would like to find out more please call or email us for more info. If you are a Fitness Facility, Business, or Organization that would like to add massage and our other expert services, please contact us using the form above.